Yay for awesome weekends am I right? I had a really good one and I hope you did too. It was so nice to see my brother again and spend some time with him and I also got some relaxing in as well. Friday was also a really epic nail mail day as ALL my goodies I ordered arrived on the same day. One of them being Dollish Polish. I have been lusting after Dollish Polish for the longest time and I have seen absolute stunning favourites come and go and I keep missing them. Thea (from Madness Nails) and I often have chats about all the ones we want and all the stunning ones we missed. So I finally bit the bullet and ordered a few and I can guarantee it won’t be the last. We don’t have ANY indies here in SA and the shipping for some of the international brands are just so crazy, especially with the exchange rate not really being in my favour. But let me show you what I got, I am SO excited! Before I do, just a note. I often hear about indies and the glitter being hard to get out or that you have to place them. Because of this, I decided to just paint this on like normal polish and see what comes out and how it looks compared to what is in the bottle. I will tell you what I think with each polish. This is 3 coats with topcoat. It is a light pink base packed full of pink glitter in various shapes in sizes and shades of pink. You *know* this is going to be a big hit with me. All that pink! Formula was really great! 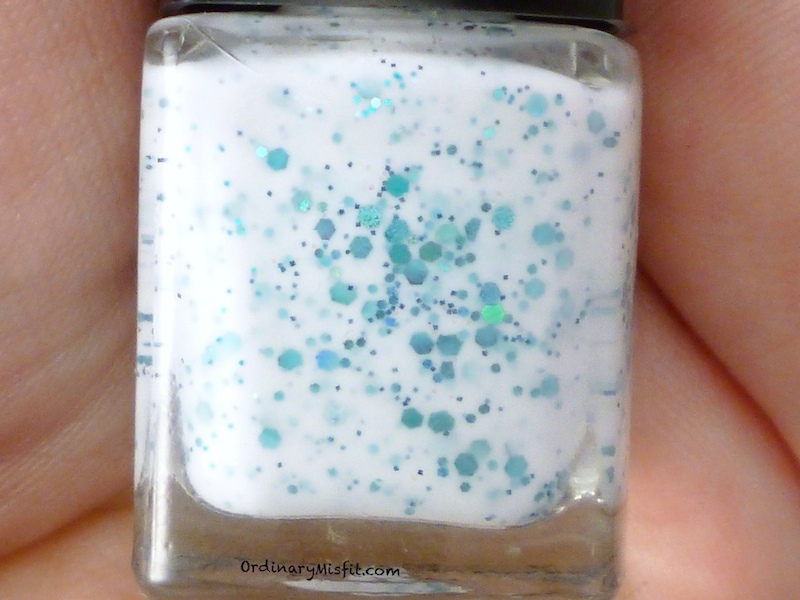 It wasn’t thick and clumpy, even with the glitters and applied smoothly. 3 coats were a breeze to apply. Here is what you can see in the bottle. I think a good amount of the glitter came out when I applied. Perhaps the very big glitters didn’t really come out all that much but I am sure with a little bit of fishing it will be fine. Or maybe just with a little extra shake. It isn’t packed with the very biggest glitter so I don’t expect them to be on every nail. Very happy with how this came out. I also adore this polish. The name? I think Dollish Polish has some of the most unique and best polish names ever. LOVE the names and the themes. I think I got a great mix of glitters out with just normal application. I can see stars in the bottle and I didn’t get any out when I applied but there aren’t very many at all and I think as I use it I will eventually get a star. I love it as it is anyway and I am very happy with it. I love it actually! As you can see, perfect distribution of glitter with normal polish application. It’s pretty perfect. The only thing I didn’t get on my nail was a moon but I did no fishing o placing and considering just how much glitter is in there, I’m very ok with that. Love love love love love love love love this polish. While I was swatching it, I had a darker purple polish on one nail on my right hand so I tried it over that and it looked even more spectacular – if that is possible. So the possibilities are endless and I can’t wait to see what I come up with next. Besides, UNICORN!!! What do you think of them? Do you just love them as much as I do? Which one is your favourite? It’s too hard for me to choose a favourite and there are still so many more I want. If you want to check out Dollish Polish for yourself and order a few (know that I am going to be super jealous of you) check them out on their website or their Facebook page for restocks and limited editions. Expecto Patronum!!!! I love it! Thanks for a cool update Michelle, the color themes are classic! Hahahaha how awesome is that! Thanks sweets! AMAZEBALLS! I’ve also just ordered myself some dollish, including It’s so fluffy I’m going to die! Can’t wait for mine to arrive. As usual, beautiful swatches. Thank you! You’re gonna love them. Ohh my gosh, that is a great haul 😮 It’s so fluffy, I’m gonna die is SO cute! Thank you! Not going to lie, the names really got me. It helps that the polishes are super gorgeous too. LOVE them. Ohhhh don’t let me give away all my secrets! 😉 Let’s hold thumbs. OH MY EFF! Even if it wasn’t my favourite of the lot, I’d lust for A Unicorn Farted, just because of its name. Where did you order from?! SheBee recently posted…I’ll be a great mom this time. Hahahahaha exactly!! It has to be owned with such an epic name. I ordered from dollish polish directly. There is a link up here I think. I love all of the unicorn praise, hahaha. Glad you could get your hands on some indies! I have a few Dollish Polishes from her early days…I think I got them on Etsy!